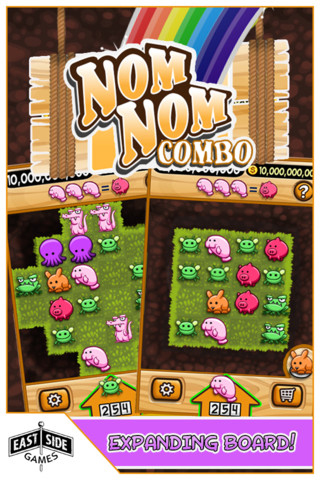 East Side Games, notorious for its successful social game Pot Farm, has just released a major update to their iOS title NomNom Combo – a game full of hungry critters and plenty of nomnoming. In this big update, East Side Games has added special Spinner Wheels to NomNom Combo. Now you can spin for more moves, mountains of coins, or even extra Critters. NomNomin’ has never been more fun. Treat yourself to new progressive boards, new quests, and new controls: drag and drop or double tap; It’s your choice. Try and complete all the new quests in the game for bragging rights and stars! This entry was posted on Wednesday, May 9th, 2012 at 12:02 pm and is filed under Casual, Everyone, Mobile, National News, New Releases. You can follow any responses to this entry through the RSS 2.0 feed. You can leave a response, or trackback from your own site.